Every year, toward spring, my team and I would sit down and look at the supply list for incoming 5th graders. We knew how expensive it was, and yet, those things on the list were things we truly used, and things we didn’t have in our budgets to supply to the kids. Yet passing that on to parents has never been easy. Now as a parent myself, I am not looking forward to the day that I have all 4 of my children in school, because let’s face it; school supplies are expensive! I get contacted by a lot of companies asking me to share their campaigns with people who read my blog. Mostly I say no thank you, after all, that is not what this blog is about at all. But when Great Clips contacted me, I had to make an exception. After all, as a parent, I would love to have Theadora’s school supplies paid for, so I am guessing a lot of you would to! So here is how to win: Great Clips is running a contest right now for parents to have their school supply lists paid for and the best part is how simple it is to enter. 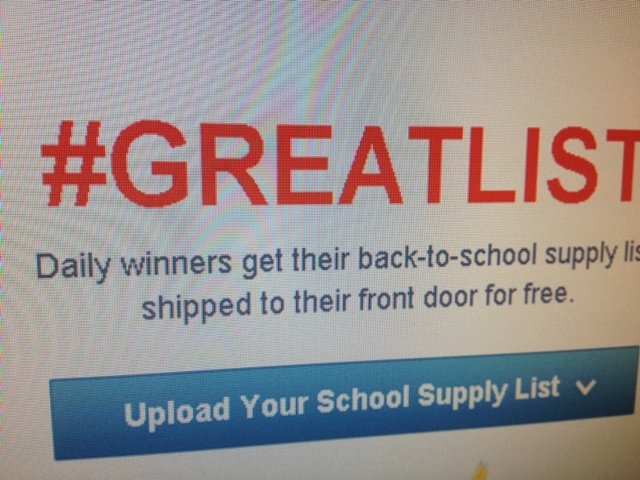 Simply go to this link and upload your school supply list. And if you can’t upload it, you can type it up right there. Yup, that’s it! They are pulling winners every day and the contest runs until September 5th. You can get up to $100 worth of supplies paid for. I hope you all win. I know I will be keeping my fingers crossed! And yes, I just submitted Thea’s list as well. I would not mind not having to pay for all of those supplies myself. PS: I am sure you guessed it but this post is sponsored by Great Clips, so thanks to Great Clips for sponsoring today’s discussion.